It’s been a long time since i heard about Exist in 08 and I was very excited to see the program back then, it was so extensive and had so many internationals, how did you manage to put together such an amazing group of artists? exist in 08 began really the year before. some friends [good friends] gave me a ticket to the uk and in 2007 I saw the National Review of Live Art http://www.newmoves.co.uk/newmovesinternational.phpin Glasgow for the first time. I had been making work, but didn’t know exactly what was going on. When I was at the NRLA, I felt I had come home. I had found a community that I somehow intrinsically knew and work I could relate to. I spoke to some artists there – specifically Black Market International http://www.asa.de/ http://blackmarketinternational.blogspot.com/& La Pocha Nostra http://www.pochanostra.com/home/, and asked if they would be interested in coming to Australia. 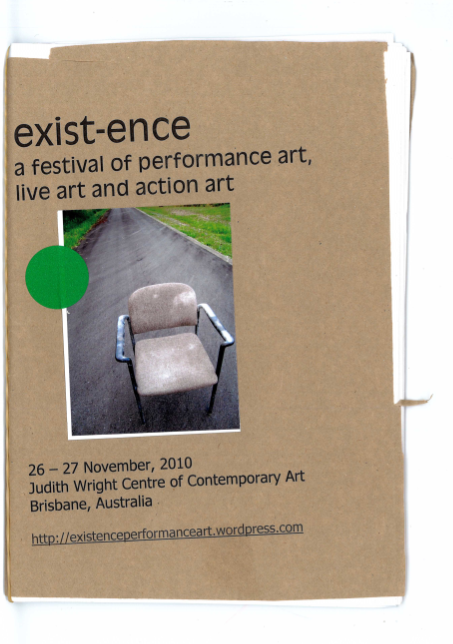 Upon returning home, myself and co-curator Zane Trow began working on exist in 08 http://www.existin08.com . 18 months later, the event took place. It took a lot of time, work, and energy. And it wouldn’t have been possible without the artists, and the strength of their work, the support of the venues, !Metro Arts and the Judith Wright Centre of Contemporary Arts, and all the funding bodies who financially supported the event [primarily supported by Arts QLD, Brisbane City Council and the Judy]. There was a great team of volunteers that helped in showing people how to get to which venues when and help explain what was going on. The artists that came, from overseas and interstate were really excited to be here. Many internationals had never been to Australia before. Finally, the event happened, and I was so excited to see this work, in my town, where I rarely see performance art, live art or action art. And here we were. It was really wonderful. Initially, I had planned to bring out Black Market International in 2008 and La Pocha Nostra in 2009. However, even though exist in 08 was funded, it wasn’t funded enough to bring out Black Market [a group of 12 + artists from around the world. they have been together for over 20 years, and have never been to Australia before]. However, 3 of the 12 from BMi, namely, Helge Meyer, Jurgen Fritz and Elvira Santa Maria Torres did make it. And your own progression as an artist, how did you come to make the work that fits under the umbrella of live art? I began as a classical clarinettist. I liked the work of John Cage, Morten Feldman, Steve Reich. In my final year of my Bachelor of Music I arranged to play with 17 others, Steve Reich’s “Music for 18 Musicians” It was wonderful. I became completely obsessed with John Cage, so much so, that the only way out was by making a MUSICIRCUS, which happened at the Brisbane Powerhouse in 2004. Over 50 artists presented over 30 John Cage works, for free in 8 hours in all the free spaces of the Powerhouse. These were my first experiences in curating and organizing events. I don’t particularly like the work of making events, but the outcomes, for me are essential. During this period I was teaching woodwinds at a range of music schools, and realised I couldn’t do this for a living. I could play at weddings. I really couldn’t change my art for anyone without become completely miserable. So I went into admin, and kept my art for me. Clarinet requires a good 4 hours a day practice to keep any chop and working fulltime, I gravitated towards making up things in my head while undertaking rudimentary, repetitive tasks at work. I was now practicing body based works in my head for longer than I was practicing music, so I started working with the body more. After seeing the NRLA in 2007, my path was affirmed, I felt a great sense of permission. Which I then grabbed with both hands and haven’t looked back. How do you see it fitting within the Brisbane art scene and also within Australia as a whole? To be honest, I’m not so au fait with the Australian scene. I think in time I will, with infrastructure such as lala for us to stay in contact. I think Brisbane is beginning to be more active in a live art sense. However, like me, I think a lot of artists don’t know what they are doing within a greater context. As more artists from out of state, overseas come here, or if the the opportunity presents that locals go elsewhere and return, one can see how a range of individual artists work within a global context of live art, performance art, action art. Speaking only for myself in Brisbane, and talking to people here, lots of artists are making up their own contexts, and own definitions, explanations of their work. Artist run initiatives are growing, but spaces are still difficult to procure, even outside the institutions of the Brisbane Powerhouse and the Judith wright Centre of Contemporary Arts [arguably the 2 contemporary art venues in town]. I think there is energy and it is growing. We just have to keep working together. What were some of the highlights of the most recent Exist-ence event held in November? 49 artists from 17 countries presented work in 6 hours. As we had one venue, the Judith Wright Centre of Contemporary arts, Shopfront for two nights Fri 26 & Sat 27 Nov 2010, the work was presented in an overlapped, mishmash milieu, with live work, artifacts dvds and streaming occuring simultaneously in the space. The first night, local artists, Thomas Quirk & Leena Riethmuller, Robert Millet, Jan Baker-Finch, Nicola Morton and Michelle Xen presented work alongside ex-pat, now Melbourne based Dan Koop. Thomas and Leena extracted bodily fluids for an extended period [tears and saliva], Robert reinacted a work by Myanmar artist Moe Satt called “SmileS”, Jan moved throughout the space in constant connection, reaction, and response to the sonic state around her, Nicola Morton presented Love Hypnosis Exchange which had the entire room spinning [which is also being presented tomorrow Dec 17 7:30 – 10:30pm @ Nu Psychedilic Exhibition at Hoffkake, 284 Albert St, Brunswick, Melbourne] and Michelle Xen provided us with a heart beat soundscape. Throughout both nights, Dan Koop undertook his work by DJK International “Wish We Where Here” in which he offered a personalized postcard delivery service – you would sit down with him, write a postcard, and let him know how you would like it delivered [whispered, sung, said while laying on back holding left elbow] and he would keep you updated via text and twitter how close your postcard was to delivery. The second night, Andi and Sun welcomed in the crowds with their performance of “Untitled [The treachery of Words], Velvet Pesu performed and in her hand made sonic and light recycled costume Concentric Circles on Red, filling the space with echoes of knowing and not knowing, while Andi and Halfpapp and Tess Maunder wrote “tick” “tock” and covered themselves with these reminders of time; I made a work “a study in red weight” a decomposition of made objects, a repetitive action, a risk in marking the body with memory, and Melody Woodnutt presented Lines and Flux, transforming the space, part meditation, part play, as earth and stones, images and actions collide. It feels like you have got a lot of these events up with just your own tenacity and personal links, how would you like to see the Brisbane live art/performance art scene continue to grow? I would like to see more artists and artists run initiatives doing more and communicating more [so we don’t end up doing things the same night as each other etc], sharing information and resources. Communication is vital I think. Now in dream mode: it would be great to have a space we can call our own. Eventually it would be great to have ongoing financial support. But in the mean time, there are no excuses. Do something. Do anything. and lets do it together. On the exist-ence front, we are looking at not only doing a festival but do more regular low key events. We are looking for a home for them at present. Hoping this will allow local artists with more opportunities to present their work. I think the more we are connected as a local, then national and then global community, the more we will grow individually and collectively. Rebecca Clunn-Cunningham is a maker and producer of live art/performance art/action art events in Brisbane. She is also a new contributer to lala!